Analysis and overview of the Standard British accent with practise material for actors. 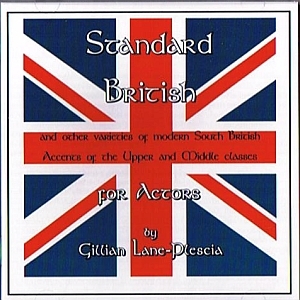 Standard British for Actors helps you acquire or perfect accents for performance. The instruction is by well known dialect coach Gillian Lane-Plescia based on recordings of men and women speaking in their authentic accents, not people imitating an accent. The CD includes examples of male and female native speakers of Standard British and other varieties of modern Southern British accents of the upper and middle classes. The accompanying small format Booklet come with with analysis, International Phonetic Alphabet (IPA) notations, notes on samples and lists of other sources. The Standard British for Actors Booklet and CD set is small and lightweight, fitting easily into your pocket or bag.